Easy, simple and delicious, this Banana Bread recipe is moist and full of flavor. The streusel nut topping puts the flavor over the top! And, you can even make a gluten free version! I can’t remember a time from my childhood where my great-grandmother or grandmother wasn’t making some sort of bread. They were constantly baking in the kitchen, often together, and I have so many fond memories of delicious breads being made in that kitchen at grandmas house. I loved their banana bread, but it was always so dry. I was bound and determined to recreate their banana bread recipe, but make it moist. Why Is This The Best Banana Bread Recipe? To make banana bread super moist, you need those over ripe bananas. That’s one secret to making the best banana bread. You want the bananas that have started browning. Take a look at these bananas I used below. You can see that I have 5 bananas that are overripe and browning. The more overripe, the better. 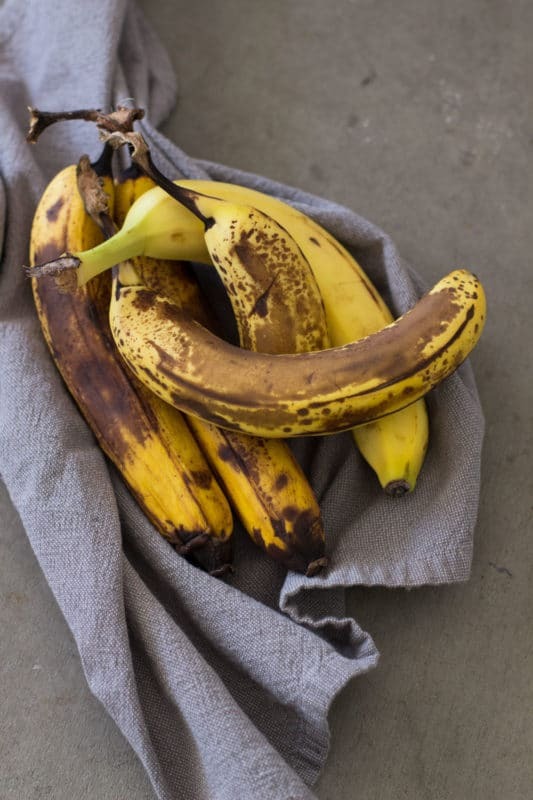 Don’t let those overripe bananas go to waste! This topping is optional, but makes the banana bread so delish! 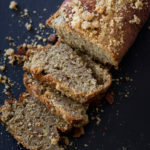 Flour – If you want to make a gluten free version, use Bob’s Red Mill All Purpose Gluten Free Flour in both the banana bread and the streusel-nut topping. Xanthan Gum – only in the banana bread recipe. 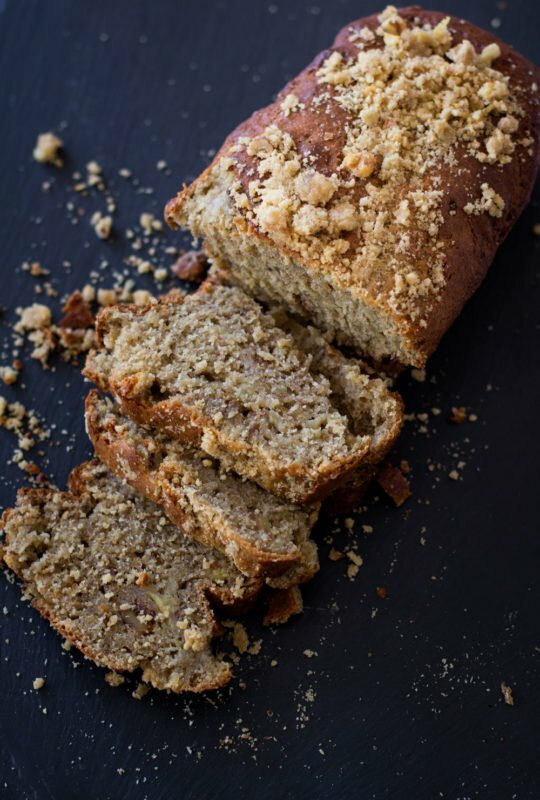 This banana bread recipe is so easy to make and makes one loaf. I use a loaf mold when making this recipe, but if you are using a traditional bread pan, make sure you prepare it with a non-stick cooking spray or grease it well with butter. Preheat your oven to 350. In a large mixing bowl, add all the dry ingredients and mix well with a whisk. 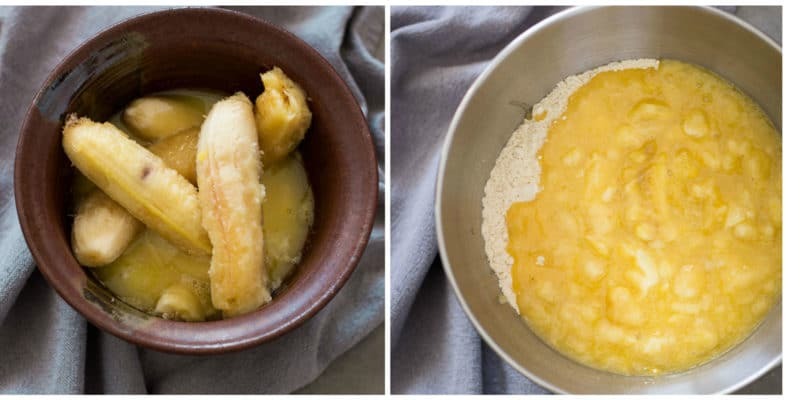 In a separate large bowl, combine the eggs, bananas, sugar and butter. With an electric hand mixer or a hand held potato masher, mix just until the ingredients have been mixed together. Make sure those bananas are smashed up but don’t over mix! From there, add the liquid mixture to the center of your flour mixture and mix well with a spatula. Fold in the chopped walnuts. 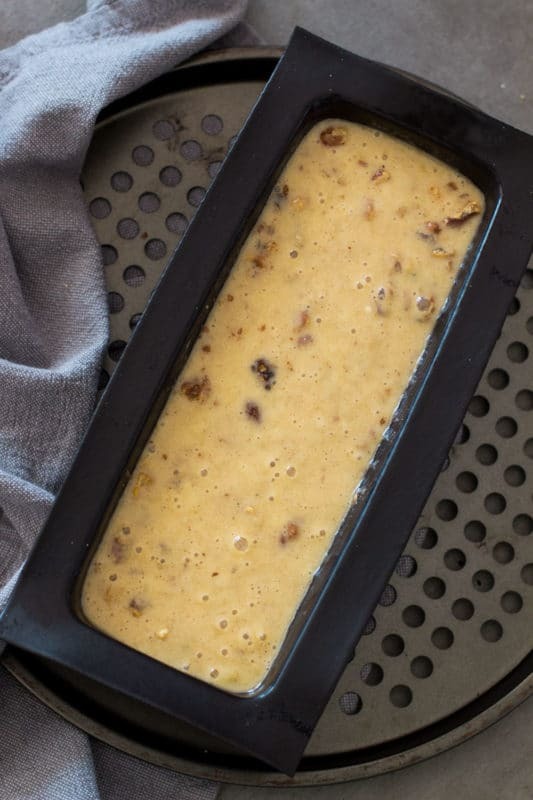 Pour your mixture into the loaf mold or loaf pan. If you want to add the Streusel Nut Topping, just sprinkle it over the batter. Cook for 60 minutes. When the bread is done cooking and if you are using a flexipan mold, wait about 2-5 minutes and then turn your mold over onto a cutting board. As you can see, the loaf comes right out with no crumbles. If you are using a traditional loaf pan, wait until the bread is completely cooled before turning over. The Flexipan mold I use to bake my bread. Traditional Bread Pans vs. Bread Molds – I use a Demarle Silicone Loaf Mold. I rarely use another brand other than Demarle when baking loaves, muffins, cakes, etc. Flexipans are so fantastic because your bread comes out of the pan perfectly, with no crumbles. The Flexipan is made of silicone and glass and it’s very flexible. Notice above that it’s sitting on a pan with holes (You can buy a holed pizza pan here. )That’s super important. The heat from the oven must have a way to get through the flexipan so it can evenly cook the bread. That is another secret to getting a super moist loaf of banana bread. If you’re looking for a a moist banana bread recipe, you’re going to love this one. You don’t typically find an overly moist gluten free banana bread recipe, but you will in my recipe because of my 2 secrets. And I’m happy to say, this simple recipe tastes just like my grandmother’s homemade baked banana bread…only better. If you loved this recipe, give it a star review! Also, snap a picture of your finished bread and share it with me on Instagram using the hashtag #recipesworthrepeating and tagging me @recipesworthrepeating. 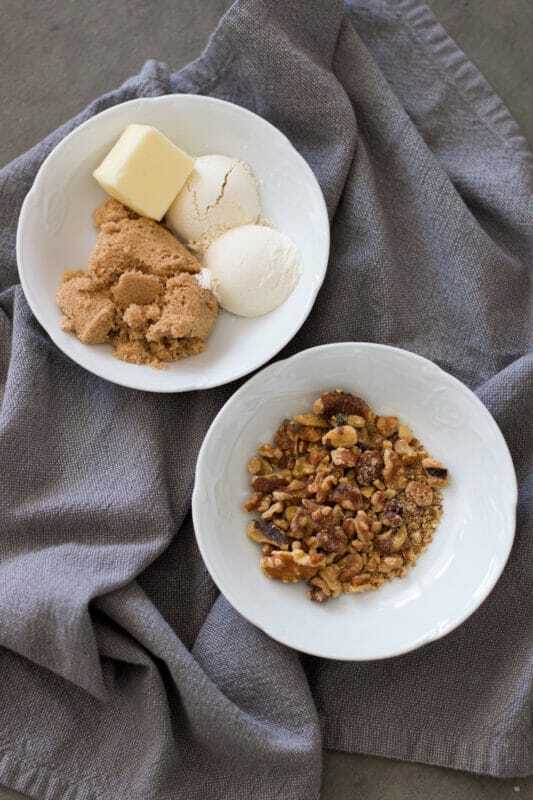 In a small bowl, combine 1/4 cup packed brown sugar, 3 Tablespoons of gluten free flour and the chopped walnuts. Ensure your butter is at room temperature and add to a small bowl. 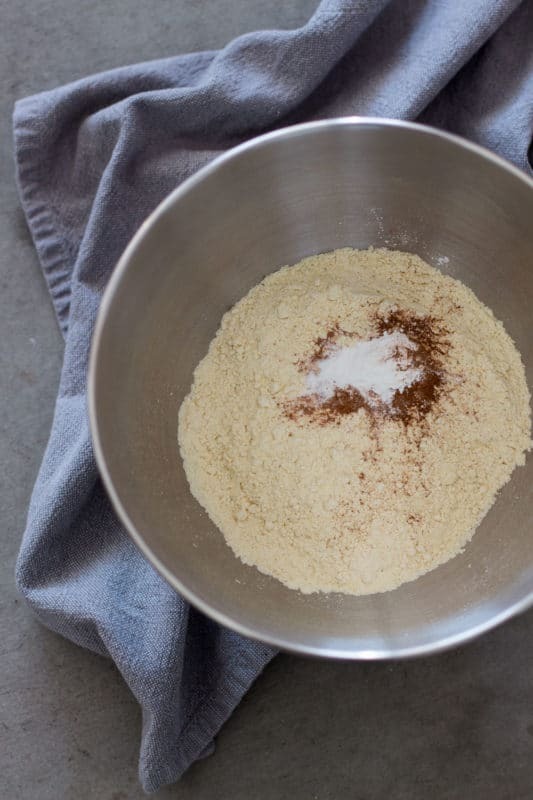 Using your hand mixer, slowly mix the ingredients together until you have a mixture that resembles course crumbs. Set aside. Preheat oven to 350. In a large mixing bowl, take the flour, Xanthan Gum, baking powder, baking soda, cinnamon, nutmeg and salt and mix well with a whisk. In a separate large bowl, combine the eggs, bananas, sugar and butter. With an electric hand mixer, mix on low until the ingredients have been mixed together. Don’t over mix! Add the liquid mixture to the center of your flour mixture and mix well with a spatula. Fold in the walnuts. At this point, the consistency of the mixture will be more on the liquid side and not so much on the dough side. This is the expected consistency. Pour your mixture into the loaf mold or loaf pan. Take your bowl of Streusel Nut Topping and sprinkle it over the batter. Cook for 60 minutes. When the bread is done cooking, if you are using a flexi mold wait about 2-5 minutes and turn your mold over onto a cutting board. As you can see, the loaf comes right out with no crumbles. If you are using a traditional loaf pan, wait until the bread is completely cooled before turning over. Slice the loaf and enjoy with a little butter spread on each slice and a cup of hot coffee! 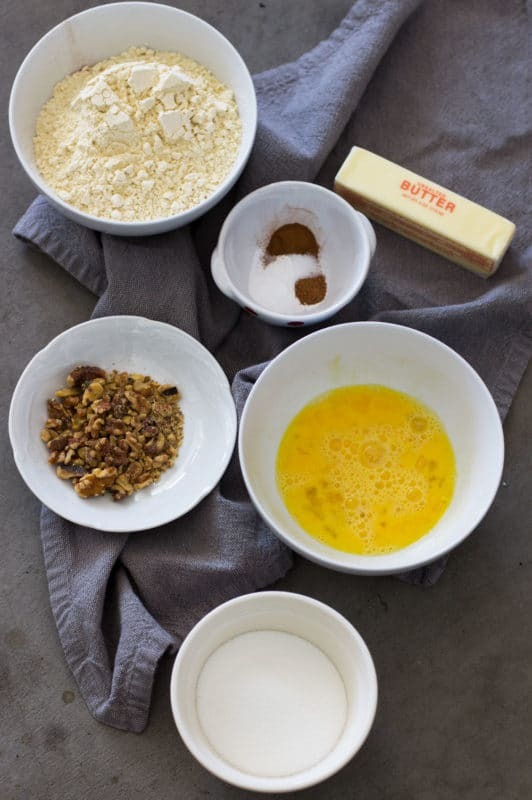 If you want to make a traditional version of this Banana Bread recipe, use the following ingredients below. Follow the same directions in the recipes card. The Streusel-Nut Topping is optional! Update Notes: This post was originally published in August 2017, but was re-published with updated step-by-step instructions, pictures and tips in April of 2019. 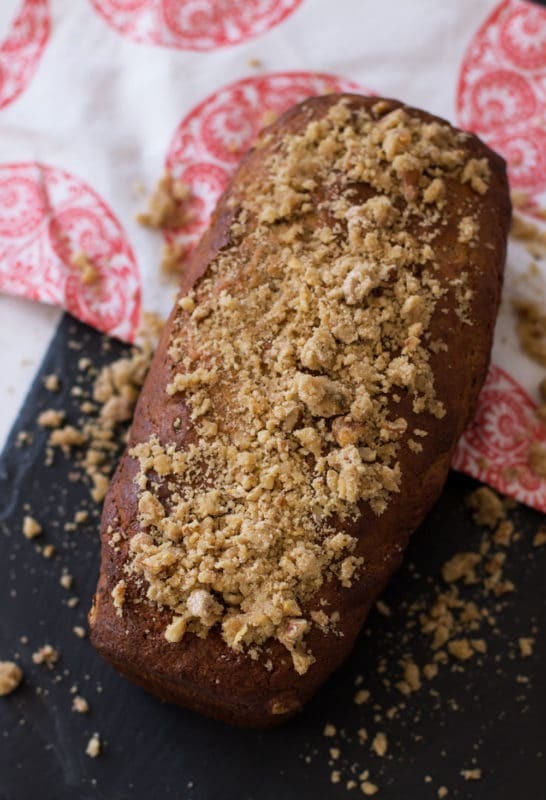 I love the idea of adding streusel to banana bread! And I agree that the brand of flour really matters. They’re not all the same. So true! That flour matters!!! I hope you love it!! I have a gluten intolerant person on my list that would love a loaf of this! Thanks for the hints on how to make it perfect! Absolutely!! Thanks for sharing my recipe!! IF you can’t find the flour at your store, just order it off Amazon! I put a link to the exact flour I use in the ingredients list! Enjoy! Mmmm! Yummy!! Perfect healthy snack for tea time. This banana bread goes perfect with coffee or tea! That topping really sets this banana bread apart. Sounds so good! Yes – the topping is wonderful, but it is optional! I like with and without to be honest!